Is Yoga a sport or a religion? Come find out! 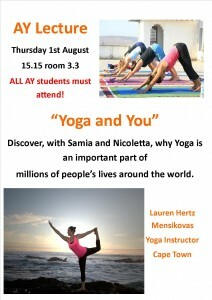 Join Samia and Nicoletta as they tell you why they have chosen to do Yoga. Learn about Yoga history, different types of Yoga, why one can practice it and there will even be a demonstration of Vinyasa Flow Yoga! Room 3.3 at 15.15 on 1 August.